The state government of Madhya Pradesh has launched the Chief Minister Medhavi Student Scheme 2018, Madhya Pradesh. This scheme is popularly known as Mukhyamantri Medhavi Vidyarthi Yojna (MMVY). Each meritorious student will receive a financial assistance of up to INR 1.5 lacs in the form of the course fee through this scheme. ** Students who have passed the 12th examination from MP board with minimum 75 % marks and CBSE/ICSE board with minimum 85 % marks can apply. ** It is necessary for the candidates to belong to MP board and hold a domicile certificate of Madhya Pradesh to apply for this scheme. ** Family income of the applicant should not exceed 6 lacs per annum. ** Students who have secured admission into higher educational institutions through entrance test like JEE Main, NEET, CLAT, etc. can only avail the benefit of this scheme. Just follow the below steps to apply for the MMVY 2018. Step 2 : Then click on the Chief Minister Medhavi Student Scheme link under Updates section. Step 3 : It will redirect to the MMVY portal. After that select Appliation tab and click on the ‘New Student’ link in the drop down list. Step 4 : Fill the Application Form with the required details and click on Check Form Validations button. 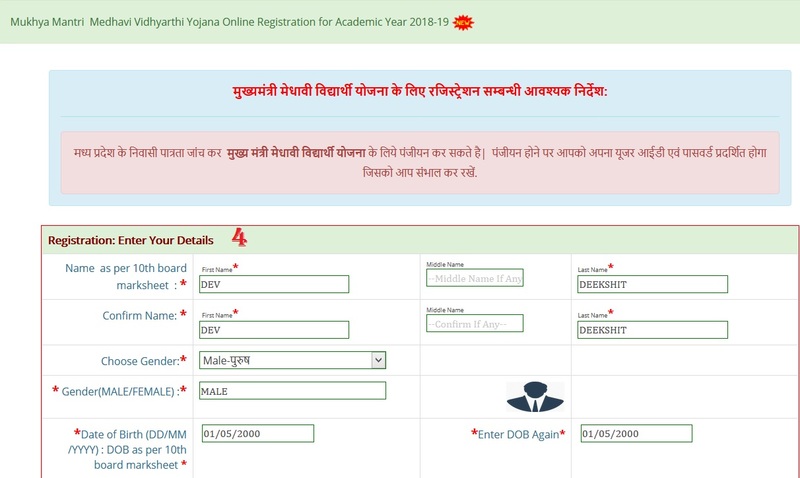 Candidates must note down their user ID/applicant ID for future login. 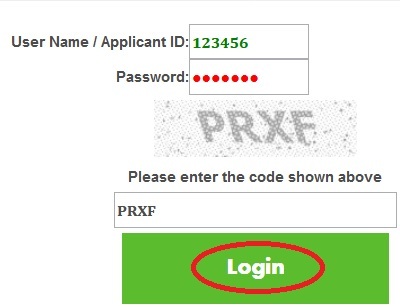 Step 5 : Next student Login with your Applicant Id & Password and fill the further details to complete the registration form. ** Students who have the JEE Mains rank under 1,50,000 and secured the admission into private or government engineering college will get the financial assistance of up to 1.5 lacs. ** Medical students who have taken the admission into MBBS/BDS courses through NEET in private/government medical college will also be benefited. ** The government medical institutions which conduct their own entrance test for admission into MBBS course also come under this scheme. ** Students taken admission into national law Universities or Delhi University through CLAT or any University level entrance exam will also be eligible. ** Students enrolled in the graduation, integrated or dual degree courses of various Universities/institutions run by the Indian government can avail this scheme. ** Additionally, students pursuing diploma courses (after 12th) from the recognized polytechnic institutions or government institutions can also apply. 1. Original copy of Verification Slip (Recommendation for Sanction & Payment of Benefit under MMVY Scheme) of your institute in prescribed format, duly signed and sealed by the authorized officials of the institute. 2. Copy of Application submitted by the student, duly signed and sealed by the authorized officials of the institute. 3. Copy of Mark Sheet of class 12th of the student, signed and sealed by the authorized official of the institute. 4. Copy of Mark Sheet of Entrance Exam of the student signed and sealed by the authorized official of the institute. 5. Copy of M.P. Domicile Certificate of the student, signed and sealed by the authorized official of the institute. 6. Copy of Income Certificate issued by the competent authority of Madhya Pradesh, signed and sealed by the authorized official of the institute. 7. Copy of Aadhar Card of the student, signed and sealed by the authorized official of the institute. 8. Copy of Fee Receipt paid by the student, which mentions head-wise / component- wise fee details, signed and sealed by the authorized official of the institute. 9. Fee structure of the institution, signed and sealed by the authorized official of the institute. 10. Copy of Bank Account Details of the institute mentioned by the institute in the portal, signed and sealed by the authorized official of the institute. 11. Head wise prescribed format for Fee paid in institution attached herewith as Appendix I.
Bhopal – 462002 ( Madhya Pradesh ). Last date to apply for the Mukhya Mantri Medhavi Vidhyarthi Yojana is 15th June 2019. If students who are admitted for BDS in private colleges under this scheme & passed 1st year, then how to apply for same benefits in 2nd year? Tell me the last date of scholarship application.